Halloween!!! We had a full day on Wednesday! 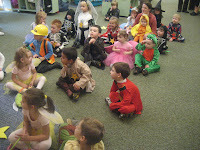 In the morning, parents are invited to join Logan's preschool class while they go "trick or treating" around the building. 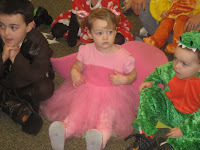 Then in the afternoon I went to Luke's school for his Halloween party! Even though the kids don't get to wear costumes, they still had fun playing games, eating snacks and making a craft. After school we got a bite to eat, got in costume and prepared to go trick or treating (Like we really needed more candy after they got so much at school!!!). After trick or treating we went to church (for more candy!) for their Fall festival. Luckily no one broke out in hives this year and we got to enjoy the night! This picture is in Logan's preschool class. Logan is in the red power ranger costume. I love the way Mikayla just blends right in! Here she is sitting in the crowd! This was in Luke's class. girl!Here they are! 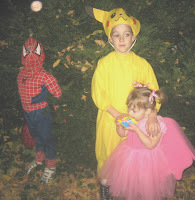 Pikachu, Spiderman, and butterfly/princess/fairy As you can see NO ONE wanted to pose for a picture before going trick or treating! I love this Picture! Logan is playing "air guitar". A rare moment where Logan was so excited I guess he just needed to break into his guitar solo. Especially funny if you knew the scene that had played out in our home moments before! Note: Logan is no longer a red power ranger, but Spiderman. After MANY mind changes he finally consented to wear his "strong" spider-man costume, but only with the gloves and mask. And of course 1 glove was missing. For those who know all the opportunities I have with Logan, you can imagine how this whole missing glove, what to wear costume ordeal was really like! But, after much searching we found it . . . in the garage! ? And of course 5 minutes after we were outside . . . he wouldn't wear the MASK OR GLOVES!!!! 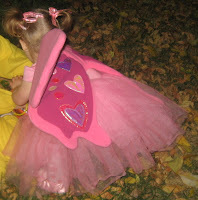 The back of her wings were especially cute, but this is the only picture we got of them. You can sort of get the idea. I have to admit, they do look cute! 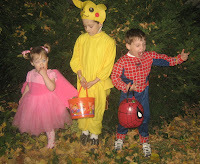 All though, I haven't celebrated Halloween in several years--don't even pass out candy.